No matter how many times i look at this photo, i still can’t believe that the man was comfortable lying on that pebble beach. He did seem to be enjoying soaking up some rays. 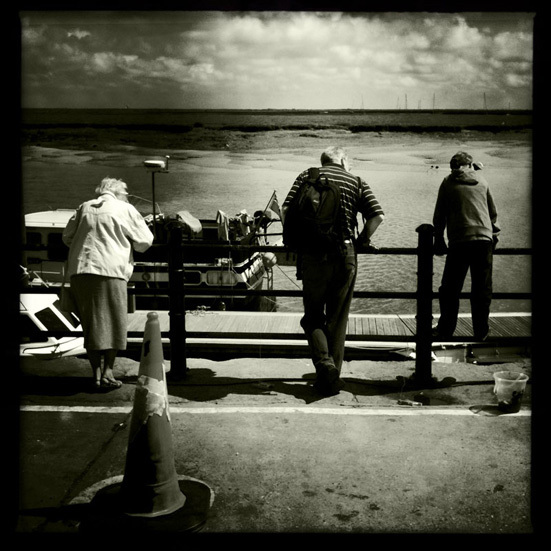 This image was taken on the sea front at Sheringham in Norfolk around 2008. Walking along the sea front, i could see this chap sunbathing from quite a way off and I just hoped that he would stay there until i could get there… AND get the photograph. Fortunately he didn’t move even though he was literally just a couple of yards from the sea front path with people walking by. No one paid him the slightest bit of notice. As luck would have it, a bench was located directly across from where my sunbather lay that provided a place to sit and a lower viewpoint for the photography. The resulting image is one of my favourites from the Norfolk Project combining a surreal moment with some humour. On the return journey, after visiting the lifeboat station at the end of Sheringham’s sea front, i noticed that he’d gone. I suspect he was waiting for his wife to return from town. The 6×6 format was used a lot in the Norfolk Project, mostly in a landscape role, but I also found it good for street images like this one. I would often remove the prism finder and look as though i was cleaning the camera – then focus and get the image. I imagine most people thought i couldn’t take a photo with a piece of the camera missing! The camera was a Bronica SQAi using a 80mm lens. Film stock was Ilford FP4. Sadly i haven’t shot much 6×6 in recent years. I think it’s time to revisit the 6×6 format again sometime soon. More images from the Norfolk Project can be found HERE. The Territorial Army (renamed the Army Reserve in 2014) makes up around a third of the total force of the British Army and has seen active service in Bosnia, Afghanistan and Iraq. Increasingly the British Army will rely on these reservist troops over the coming years. These pictures were taken on exercise and at a recruiting night in 1996, initially as a project about the role of the TA and how part-time soldiering fitted into the British Army, but the images also helped a promotional campaign for gaining new recruits. The TA project is one project i would like to return to at some point though probably not to the same squadron. In the years since these images were taken, the Army Reserve has seen a resurgence in its roles within a modern British army. In future, a sizeable number of personnel within the Army will be reservist. Thanks must go to everyone at the 125th Field Squadron, 75th Royal Engineers in Stoke on Trent for their assistance. These images were taken on Kodak TMAX 400 and Ilford FP4 film. This gallery is being expanded to include a number of new previously unseen images. Making Movies follows the production of film in Whitby using an iPhone. Sadly the production ran into difficulties – film making is not an easy business – however the photographs shown here show the early stages of filming from June 7th to late July 2010. The Polaroid style images were made went into the second book i made for the 2010 Solo Photo Book Month project. Solo Photo Book Month was an online photographic project (sadly the project closed in 2011) where the participants had to shoot, edit and design a PDF photo book in 31 days. An extended PDF book can be downloaded from the HERE featuring more images from the project. The other PDF books from the Solo Photo Book Month projects are located in the photobooks section of the website.